K-Pop Stars' Real Personalities : Who is the Good-Natured Star? Many fans are curious about K-Pop stars' real personalities. As the stars are shown on the stage or TV only, ordinary people can't figure out if the K-Pop star is good-natured or not. Who do you think is the good-natured K-Pop star? Let's talk about Kpop singers' real personalities. Actually, most of K-Pop stars look good-natured as long as they are with influential people in show business such as TV producers or reporters. During years of trainee period, they take not only vocal lessons but also etiquette lessons. With a loud voice, the idol stars usually make a deep bow in front of people concerned. Let's take a look at an example that shows the effect of education. In Korea, the drama 'The Queen's Classroom' has been aired through MBC. Unlike other dramas, child actors took the major roles in the drama. In Korea, child actors usually participate in the filming with their moms. However, among the cast of 'The Queen's Classroom', there was one child actor who made a contract with entertainment agency to be trained as a K-Pop star. Most of child actors ran to their parents after finishing the shooting. However, on the contrary, the child actor who has been trained by the agency, stopped by each of staffs to make a deep bow. Isn't it amazing? Now, I shall talk about good-natured K-Pop stars. In former days, I have visited Tokyo to watch 2PM's Tokyo Dome concert. After the event, I met with 2PM members at a wrap-up party. All six members have attended the party. In fact, it is exceptional that K-Pop artists attend the wrap-up party with reporters in person. As a general rule, staff members from the artists' agency attend the party instead of them. However, without looking displeased, 2PM members expressed their thanks to every single attendee for visiting the group's concert. It was quite impressive. When I was about to leave the party, member Jun.K held out his hand for handshaking, saying he was so sorry for not giving a greeting because there were too many attendees. 2PM's proper conduct might be influenced by Park Jin Young, the chief producer of JYP Entertainment. Last year, when I had an interview with Park Jin Young, he said "JYP artists are the ones who are good-natured. I pick out singers who are good-hearted and modest." 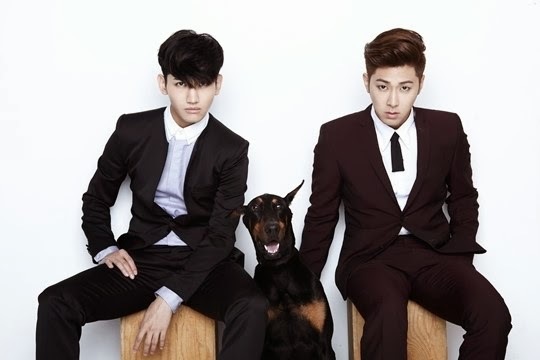 TVXQ is also recognized as a good-natured K-Pop star. It has been 10 years since the duo debuted, but they are still friendly to everyone. When I visited their concert held at the Nissan Stadium of Yokohama, I could verify how faithful they are. TVXQ did their level best for everything. Their extended service to fans was a clear template of how a true superstar should act. They tried to make eye contact with every single fan to satisfy all the fans. They also answered all the questions asked by reporters in the sincere and frank way. At the end of a press interview, U-Know Yunho waved a greeting to one reporter who is an old acquaintance with him. Big Bang's G-Dragon is well-known for behaving politely to others. '90 degree bow' is his trademark! Check out the video clip below. K-Pop rookies usually do this because they are trained by agency to do so. Of course, not all the K-Pop stars are good-natured. There are some arrogant stars too. Years ago, I went to the back stage to have an interview with K-Pop girl group. (I shall not say who they are) Most of the members, except for one member(She is the leader of the group), treated people with an arrogant manner. They listened to people in an absent sort of way. The leader struggled by herself to smooth things over. However, on the stage, the rest members made a fake smile. I've never met anyone so two-faced. Oh, I hope you don't misunderstand me. There are much more good-natured K-Pop stars than arrogant stars.